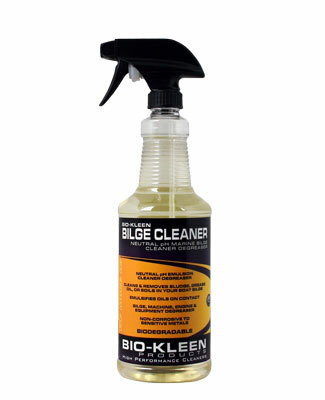 Biokleen Bilge Cleaner is a biodegradable, non toxic boat bilge cleaner degreaser. Degreases and dissolves any sludge, grease or soils in your boat bilge. A neutral pH, multi purpose, emulsion cleaner degreaser that is safe, non toxic and biodegradable. A special appeal is it's non corrosive to metals, so it can be used on just about everything. Cleans boat bilges, machinery, parts, equipment, and is great for engine degreasing. Safe and economical for use in marinas, factories, and garages. Clean with a micro fiber towel or a soft grip body brush for best results. Cleans boat marine bilges, machinery, parts, equipment, and is great for engine degreasing. Safe and economical for use in marinas and garages.